The SMHS Makin' Hay 10k is the sister race to the October Spook Hill Cider & Wine 4 Mile Run in Burkittsville. If you haven't run Spook Hill, you don't know what you're missing! click here to Visit SMHS online! We are a very small non-profit whose mission is to preserve and record the rich history of Burkittsville, MD. The runs we put on help us to keep the lights on! We invite you to join us in exploring the history of Burkittsville, a small rural community nestled at the base of South Mountain in western Frederick County, Maryland. 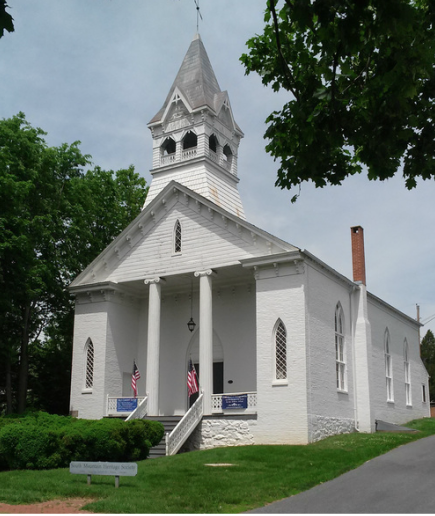 Our museum, research library, and offices are located in the beautiful Resurrection Reformed Church, an architectural landmark built in 1829, used as a house of worship for the community for over 150 years and the site of a field hospital during the Battles of South Mountain and Antietam. We preserve a growing collection of manuscripts, artifacts, photographs, and other objects from Burkittsville and the surrounding area. In addition to our museum and research library, we host a number of events and programs each year. Membership in the society offers great benefits and the opportunity to join us in celebrating the story of Burkittsville, its people and its landmarks. at 3 East Main St, Burkittsville. SMHS hosts a wonderful used book sale each October. P.S. As you're doing your spring cleaning, be advised that we accept book donations year-round! There is a collection box near the side entrance to the museum!